Heat up crisp, chilly nights in the fall and spring with a fire table. Not only is this outdoor furniture beautiful, but it’s functional as well. Even without fire, these coffee tables are visually stunning. The center of each fire table features a well where you can burn fires to add warmth and create a peaceful ambiance. Your friends and family members will love gathering for drinks and appetizers around the fire table. For those of you with children, you can gather together as a family and roast marshmallows for s’mores, a truly delicious treat. If you desire even more heat in your outdoor space, you could install an outdoor fireplace to your backyard. Not only are our gas fireplaces easy to work, they’re low maintenance as well. Relax and gaze at the flames of your outdoor fireplace, staying nice and toasty no matter how cold it may be outside. No doubt about it; the ultimate luxury outdoor item is a home spa. What feels better than stepping into the warm bubbles of a hot tub after a difficult day? Spa Hearth & Home is your one-stop shop for both outdoor patio furniture and home spas, which makes your shopping experience so much easier. You may be craving a more basic hot tub for relaxing and unwinding. The more athletic types might be interested in our swim spas, which can be used as a hot tub or for exercising. Don’t forget your accessories for your outdoor patio furniture. A fuzzy blanket adds an extra dose of coziness when curling up to your fire table or outdoor fireplace. If you have a hot tub, swim suits are optional. However, a plush bathrobe is highly recommended for walking to and from your house, especially when it’s really cold outside. You’ll also want some comfy slippers to keep your feet warm as you pad around your outdoor oasis. By far, the best accessory year-round is a drink in your hand. In summer, you might prefer a refreshing cocktail or an ice-cold beer. For fall, you could switch to a more autumn-appropriate hard cider, which will match the color of the falling leaves quite nicely. Winter calls for a hot toddy or hot cider to help keep you warm on the chilliest days. 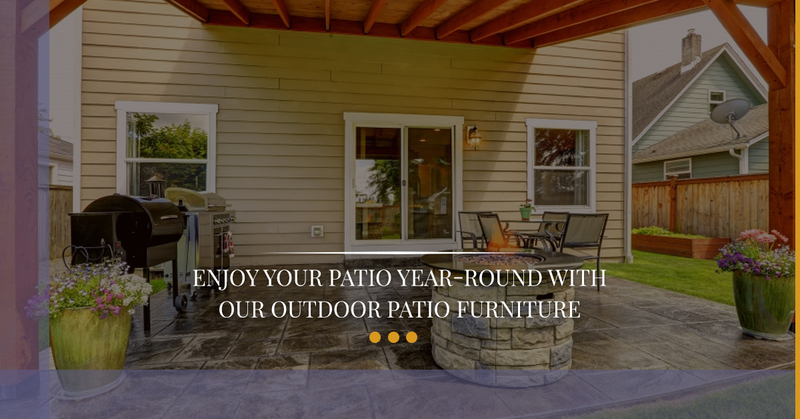 Don’t hesitate to add to your outdoor furniture collection so that you can enjoy your patio all year long. Shop our outdoor patio furniture selection in Maple Shade. Spa Hearth & Home features something for everyone in our huge showroom, so stop by today.